"A Call for Unity Towards One Vision, Mission and Goal"
The activity was attended by 14 Churches, (Angeles,Pampang, Sapang Bato, Pandacaqui, San Fernando, Bancal, Magsaysay, Sta. Catalina, Sta. Cruz, San Pablo Lubao, Sta. Maria, Edsa, Batang II & Culis). 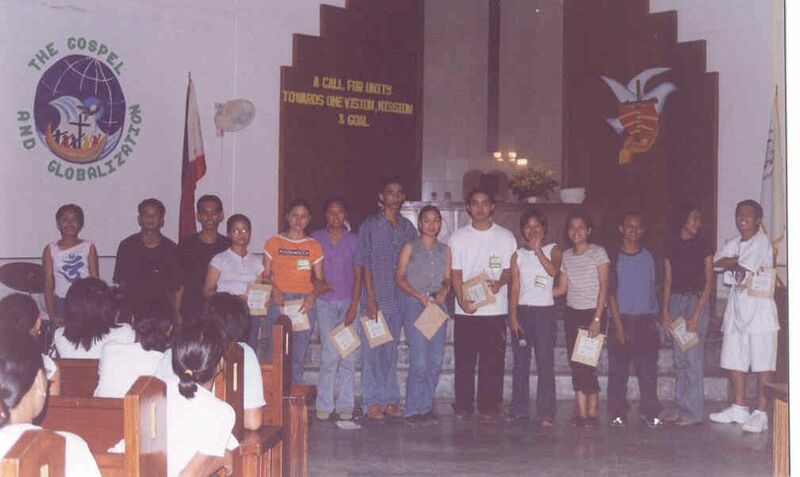 It was divided into two program the 1st part was Worship Service at 4:30 pm, It was headed by Ms. Joy Mendoza as the Liturgist, Pastor Aguas & Ms. Rachel Gail Abad, the CYF-NYA president 1998-2002, our special guest speaker. She interpreted the detailed information about the CYF Vision,Mission & Goal. After dinner was served the second part of the program follows, it was a Raffle Concert. The host was Bong Tolentino, Jell Pring & John Langit. Our Special Guest, the UMC Band lighten the mood and wake up the CYFers with their praise & worship Music Medley. The opening prayer was interpreted to a a song by the Shepherds Choir of Edsa singing Siyahamba, Marching to the light of God. To entertain everyone and serve as an intermission during the raffle talented CYFers shared their talents thru Music serenading everyone (1) The Power of Love by Sheryl Aguilisan & Jan Michael Munoz (2) Sta. Catalina Choir (3) Sta. Cruz Choir (4) Angeles Choir (5) Faith & Yeng Marzo & (6) Erwin Baluyot from Angeles. Thru this performers, the Vision of CYF was seen, The CYF commits itself to the total development of the youth for a more responsive and effective leaders in the Church and the Community. To Illustrate the Mission, we invited the San Pedro Bancal CYF Theater Group to show a drama representation of what is life without God and what is life in hell. The mission of CYF is to help usher in the kingdom of God and the liberation & transformation of church and society. Lastly, the highlight of the activity was the Goal of CYF, and that is Unity to all, we are all on the same boat, the joy of serving God together. This was shown thru a video presentation of all past pictures of CYF activities with a background music of a live performance of Lead Me Lord by Doc Ian and Aznar. During this event 20 consolation prizes were given to lucky persons, 10 Cakes and 10 prepaid Cards worth P300.00. The major prizes were given to the following 3rd prize (Nokia 5110) Doc Ian; 2nd prize (Nokia 6150) Ronald Tolentino; 1st prize (Nokia 3310) Donna de Leon. After the event certificates were given to each local church who attended, Cakes, CD & Certificate were given to the special guest, the UMC Band & San Pedro Theater Group. This night was also the distribution of the 1st issue of Mabie. A Praise & Worship Singing from UMC Band and a closing prayer was given by Pastor Shirley Santos to close the said event.